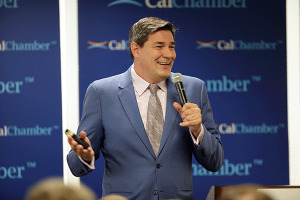 U.S. and California politics and trade priorities, global connections and the importance of exports were the topics discussed by an international trade expert, a veteran political columnist and an economist at the recent international forum presented by the California Chamber of Commerce. 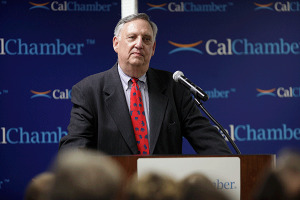 California has grown to become the world’s fifth largest economy and California accounts for a significant slice of exports; in fact, California logged a 3% year-over-year growth in exports, Tasharski noted. Turning to the administration’s trade priorities, Tasharski reiterated that President Donald Trump has said his administration is dedicated to reducing the U.S. trade deficit, which is why he’s taking a firm stance in addressing unfair trade practices and foreign government export subsidies. The Commerce Department is committed to reinforcing and implementing President Trump’s commercial agenda to support, defend and bolster the American economy. Earlier in the week, U.S. Secretary of Commerce Wilbur Ross honored 43 American companies, representing 18 U.S. states and Guam, with the 2018 President’s “E” Award to kick off World Trade Week. The President’s “E” Award is the highest recognition any person, firm, or organization can receive for making a significant contribution to increasing U.S. exports. 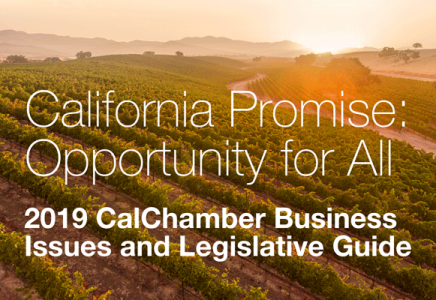 Tasharski reported that California companies were well represented in this group. Walters tried explaining the “inexplicable,” California’s top two primary, which is “where a loser gets another chance to be a winner.” This method of electing California’s representatives creates all kinds of political dynamics unique to California, he said. Still a low chance of recession in the next 24 months. Trade barriers, and what he would call imbalanced trade practices, don’t have an impact on the trade deficits, but we know when two countries trade with each other, there are gains from trade. Thornberg presented the hypothetical of a pile of money on the table, and if someone isn’t playing fair, they’re taking more than their fair share of the pile of money on the table. In other words, it’s not that the U.S. doesn’t benefit with trade from China, even under the current situation, where the Chinese have far more access to U.S. markets than the other way around…but we don’t gain as much as we should or could because we don’t have the same access to the Chinese economy. 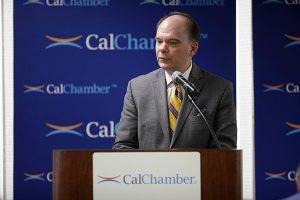 While discussing trade battles, Thornberg said that since California has such a large and diverse economy, the state is less exposed to trade battles than other parts of the United States. In closing, Thornberg said the big picture is that it’s going to be a good year, but there still is a great disconnect.